Previously in Club Capcom Magazine, Dr. Right had resolved to set aside some time in his busy schedule to devote to solving your questions. Jumping at the chance to get their burning questions answered, Capcom fans from all over Japan submitted their questions for the good Doctor to answer in the next issue. Some of these were outside the scope of even Dr. Right’s wisdom, but Right perseveres and always attempts to give at least some kind of answer. Will knowledge prevail? Q. What kind of foods does Rockman like to eat? A. Well… Actually, Rockman’s body is powered by “Solar Energy.” Therefore, he doesn’t really eat, but there are some things that are okay for his consumption… Around the lab, he enjoys drinking “Energy Juice.” As responsibly as he behaves, he’s still a kid after all. Q. The 8 bosses from Rockman 4, like Brightman and the others, were built by Dr. Cossack. So why are they considered to be Wily Numbers? A. That hooligan Dr. Wily had performed considerable revisions to Dr. Cossack’s robots… Or, to put it more simply, he “remodeled” them. That is why they are included among the Wily Numbers. Q. Is the Rockbuster ambidextrous? A. Mm-hmm. Very perceptive of you! You’re quite right, both arms are capable of transforming into a Rockbuster. Q. Seems like Dr. Wily is always creating new boss characters. Where does he get the budget to make all of these? A. I must admit, I’d like to know more about that myself! It could have something to do with backing from that mysterious organization the “X Foundation”… It’s all very suspicious. Q. I heard that Dr. Wily used to be a good doctor, so how did he change into an evil doctor that tries to take over the world? Q. The shots that the Rockbuster fires from the hand, what are those exactly? A. The Rockbuster on the arm fires something called a “Solar Bullet”, essentially emitting a compressed form of solar energy that’s very powerful. Q. I heard a rumor that says Ken from SFII gets married to a transvestite. Is that true? A. Utterly false. I assure you, Eliza is all woman. She and Guile’s wife Julia are actually sisters, eventually making Ken Guile’s brother-in-law. Neither one knew about this when they fought each other, but I wonder if things might have been different if they had…? Q. How does Ryu pay for his living expenses? A. Back when he was living in Japan, Ryu would teach students at his Master’s Dojo, and never had to worry over living expenses. But to pay for his recent warrior training abroad, he’s turned to betting on himself in street fights. That way he can make money all while training his body at the same time. Q. What are those bones Dhalsim wears around his neck? A. Oh, those? I believe Dhalsim called it a charm. It’s based on a belief that purified bones have a mysterious power to bring about blessings and good fortune. They’re very precious to him. I once asked to borrow them just for a moment, and he angrily replied by blowing fire in my direction. He reminds me of Heat Man! Q. What are those things Chun Li wears on her wrists? A. I don’t know much about them, but perhaps they’re some kind of protective gear. They appear to be very heavy, so they might also serve some important training purpose. That Chun Li, what an exceptional spirit! Q. 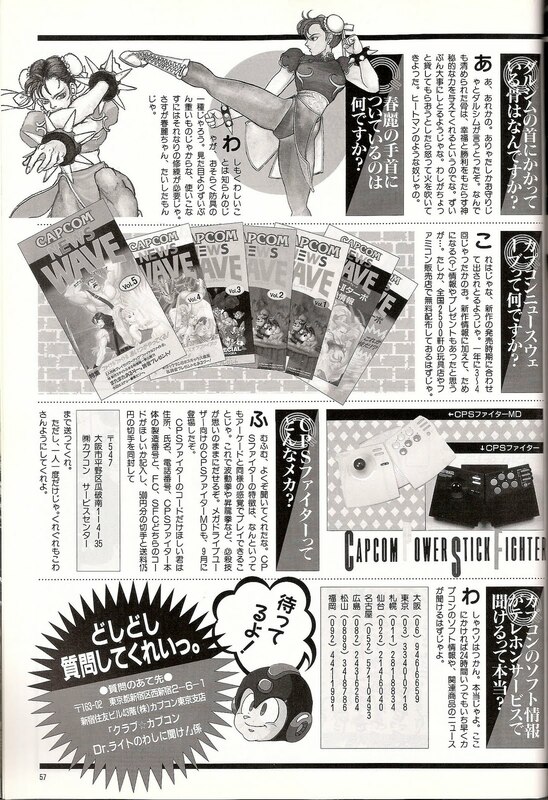 What is Capcom News Wave? A. You mean these? They come out around the times when the new software goes on sale, around 3~4 times a year. It includes all the news on the newest products, very useful for keeping up with the latest info and present campaigns… If I’m not mistaken, they are distributed free of charge at over 2500 toy shops and Famicom stores nationwide. Q. What kind of accessory is this CPS Fighter I keep hearing about? A. Ah, yes, now listen carefully! The CPS Figher is a unique device that allows you to feel the same great play control of the Arcade, in your own home. With this, you can easily perform special techniques like the hadouken to your heart’s content! For Mega Drive users, there’s also a CPS Fighter MD releasing in September. If you just need a cord for your CPS Fighter, write your name, address, telephone number, CPS Fighter serial number, and whether you need a FC or SCF cord. Include a 500 yen certificate and 175 yen for postage, and send it to the Capcom Service Center. However, this offer is limited to one time per customer. They’re quite strict about that, I’m afraid. Q. Is it true there’s a telephone service where you can hear information on Capcom’s software? A. You heard right. This one’s absolutely true! You can call any time 24 hours a day for the latest gossip on Capcom software and catch all the news on Capcom related products! Don’t stop sending in your questions! Normally, I’d say something first about the Rockman trivia we learned in the column, but somehow, the Street Fighter questions caught more of my attention. Seriously, what was up with that transvestite question? Was it really such a prevalent rumor that Capcom felt they needed to address this, or did Capcom just have a sense of humor about it? Looking at the ending in question… Hmm, I guess I see what they meant. Not your best side, Eliza. Dr. Right again shows an active fascination with Chun Li, but I guess everyone did in 1993. And apparently in addition to Right’s mastery of hadouken and shouryuken displayed in the X series, he’s also hung out with Dhalsim. It seems he gets around when he’s not cooped up in the lab! Back to Rockman, Right was good enough to explain the Rockbuster’s solar bullet, different from the US version’s plasma cannon. Energy juice may already sound familiar to you if you keep up with this blog. And we can say now why there’s no Doctor Cossack Numbers, although the end credits of the game just listed numbers without letters, and a few of them were mixed up in order if I remember. The answer connecting Wily’s funding and the X Foundation is a plug for Rockman 6, which was still eagerly awaiting release when this issue came out. Also, we got Dr. Right’s account of how Wily changed from brilliant colleague to mad scientist, no horrible lab accidents or double-crossing assistants involved. Rather tame, in comparison. That’s it for this time. There’s one more Ask Me! to go, and it’ll touch on franchises we have yet to see come up in the column before. Of course, there will still be plenty of Rockman questions, too. I’m thinking I’ll follow the pattern and save it for the middle of next month. Look forward to it then! 2 Comments to "Dr. "I’m Always" Right Breaks It Down"